March 9, 2011 - Today, tens of thousands of ballots have been mailed to Transportation Security Administration (TSA) Officers as they prepare to cast their votes in a historic representation election that will provide an avenue to improve their work lives and an opportunity to improve agency performance. ?TSA Officers can vote in the largest union election in federal labor history,? NTEU President Colleen M. Kelley said. ?We are ready for this election and I believe that NTEU offers the best path to create a better tomorrow for the entire TSA workforce.? In the weeks leading up to the vote, NTEU has been engaged at airports across the country in ?get out the vote? efforts and has received overwhelming response. From bowling nights in Houston and St. Louis to meetings in Chicago and New York to open houses in Indianapolis and Des Moines. NTEU is hosting events at airports across the country to answer TSA employees? questions about how to participate in upcoming election, why NTEU is the best choice to represent them and how recently granted collective bargaining rights will improve the agency and their work lives. Additionally, Kelley has been meeting with TSA employees, including recent visits to John F. Kennedy Airport in New York and Washington National Airport in Virginia. ?In speaking with TSA employees, I have heard an outcry for improved work lives, more consistent management policies, and the type of high quality representation that they can only get from NTEU,? Kelley said. 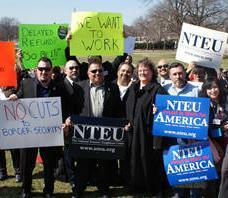 ?Exclusive representation by NTEU is half the battle in making much-needed improvements for TSA employees. Collective bargaining rights, along with an NTEU contract, will result in vast improvements in TSA?and not just for employees. It will lead to a better agency, and that will be a positive step for the traveling public.? In a recent survey conducted by NTEU, 85 percent of TSA employees surveyed believe that union representation would have a positive impact on TSA?s overall effectiveness. In the largest union representation election in federal sector history, TSA employees will have the opportunity to vote from March 9 through April 19, with votes tabulated on April 20 at the Federal Labor Relations Authority (FLRA) headquarters in Washington. In the previously largest election run by FLRA in 2006, the Customs and Border Protection (CBP) bargaining unit voted by more than a two-to-one margin for NTEU over the other union that is seeking TSA representation rights. The FLRA is the body that oversees federal sector labor-management relations, including union representation elections. Employees qualified to vote includes full or part-time, non-supervisory TSA Officers, including Behavior Detection Officers, Security Training Instructors, and Equipment Maintenance Technicians. Qualified employees must have been in their positions on January 29, 2011, as determined by the FLRA. Voting information will be mailed to home addresses of all qualified employees and voting be conducted via phone or Internet. The entire pool of qualified voters numbers roughly 44,000 employees. ?Just like the CBP Officers that they work side by side with in the airports, I am confident that TSA employees will see that NTEU is the most effective union in the federal sector and is the best choice to represent them with the Department of Homeland Security as TSA continues to move closer to fulfilling its potential to become a world-class transportation protection organization,? Kelley said.